As an artist and decorator, I am passionate about enhancing walls with art. Yet, I meet a lot of people who live with bare spaces simply because they have no idea what they would select or where to even go to find art that suits their taste and budget. Besides pieces you may have inherited along the way, art usually enters your life through circumstances that involve the perfect mix of serendipity and your own initiative. If you're walking down the street and spot a gem in a local gallery window and you're smitten but don't quite have the place for it in your home, is it still a good idea to make the purchase? Absolutely. Art is meant to speak to your heart more than to your brain (which is going to immediately question "where to put it"). Art is always more loved and appreciated when it's obtained from an emotional place. Buying art simply by following an aesthetic system dictated by the professional practice of design is never going to feel right in a personal space. And art is all about how it makes you feel. However, if you're on a mission to fill an empty expanse of wall space and don't know where to start, use the information here as a starting point. First, let's be clear about what you can hang on a wall. For most people, the image of a print or painting comes to mind. In fact, there are many different types of artwork that can be hang. Canada has an extraordinary number of skilled and innovative artists who work using various mediums and a majority of the works fabricated are specifically made to be displayed on a wall. Second, before bravely venturing forth to search for the perfect piece, you must determine whether you want a piece that is attainable or aspirational, meaning something that is on the more affordable end of the spending spectrum would fall in the attainable category. If you are driven to go on a literal vision quest to find artwork that will stand the test of time and stay with you forever - an investment - you can define this as aspirational. The attainable/aspirational axis will determine your budget and the places you will choose to go in your search for art that suits your taste and budget. Room Type: Is this wall hanging for a private area such as a bedroom or will it be hung in a more public area like an entrance hallway? Is the area informal like a kitchen or more formal like a dining room? These are very important facts that will determine the subject matter (you would likely prefer a less dramatic wall hanging for your kitchen than you would for your living room). Lighting and Colour of the Walls: If the room in which the artwork will be showcased is well-lit either with natural or artificial lighting AND has white or lighter gray toned walls (the most easygoing wall colour tones for displaying art work), you can display any kind of art (either muted or bold). However, if the room is well-lit BUT has yellow, blue, or other colours on the wall (including patterned wall paper), the lighting won't matter because the wall colour now takes precedence and will compete with whatever is hung. In this case, you will need to choose something that really stands out against the backdrop of the wall. Mix It Up: When it comes to art, you don't need to determine your existing interior style to select the right work. Whether your style is Traditional, French Country, Modern, Contemporary, Industrial, Transitional, Mid-century Modern, Art Deco, Scandinavian, Rustic, Boho, Shabby Chic or something else (use this cheat sheet to determine what that is for you), it is not necessary to match the art. You could choose to reflect the same style of interiors in the art but it makes for a very dull effect. Design professionals prefer to mix architectural elements, furnishings and art. This means that you can exhibit traditional art in a modern space and modern art in a traditional space full of antiques. Have you ever noticed that interior design magazines often feature very traditional spaces (complete with ornate architectural mouldings) that are decorated with contemporary décor or sleek, modern lofts filled with vintage finds and antique furniture? Just be aware that this type of tossed salad styling requires a modicum of precision and restraint. Wall Size: When considering proportion and size, it is best to choose hanging art that covers 50 to 75 percent of a wall. More contemporary spaces always display large, oversized pieces on walls but these are suitable only for open rooms that either have the benefit of very high ceilings or a large square footage. For example, lofts are wonderful places to hang larger works due to the more expansive room sizes (lofts usually combine many rooms into one space). Note: If you have found a work you like but are unsure about dimensions or colours in your space, keep in mind that many galleries offer an art rental option which allows you to take a work home and "try it on" before making a commitment to purchase. 1. Art Prints: Consider purchasing an art print (which is a step up from a poster). Art prints use the highest quality paper and inks and achieve true colour reproduction as opposed to a poster which may use inferior paper and inks. I find that art prints (and posters) are a cost-effective way of adding wall art. On a personal note, I purchased a very large and striking art print many years ago for my first condominium from the Bata Shoe Museum which depicted the evolution of women's shoes. I had it professionally framed and it made such an impact that when I sold the property, the buyer insisted that the poster be included! Every major Canadian city has a public art gallery and they have wonderful brick and mortar as well as online shops which sell a minimal and curated selection of art prints and posters. Consider visiting gallery shops at the Art Gallery of Ontario located in Toronto, the McMichael Canadian Art Collection located in Kleinburg, the National Gallery of Canada located in Ottawa and the Vancouver Art Gallery obviously located in Vancouver. Professional Hint: The most common error is to hang art too high on the wall. Do not make that mistake as it makes the space appear cheap. The rule of thumb is museum or gallery height, which usually means the center of the work should be at 57 inches. This reflects the standard eye-height of the average person. However, you may have to make height adjustments based on whether the work is being hung above furniture such as a bed with a headboard, a high sideboard, or low sofa. In such cases, it is better to hang with at least a 3 to 4 inch clearance. You may also choose not to hang but instead do the "lean" which means to place the base of the artwork directly on table top furniture (a sideboard, chest of drawers, or console) and lean it against the wall. This is becoming a very popluar method of displaying wall art as it adds a casual chic touch to a space, does not require any tools, and keeps walls free of holes. Just be sure the artwork is not too heavy for the piece of furniture holding it and also ensure the art work is secure and does not slide off the tabletop surface. 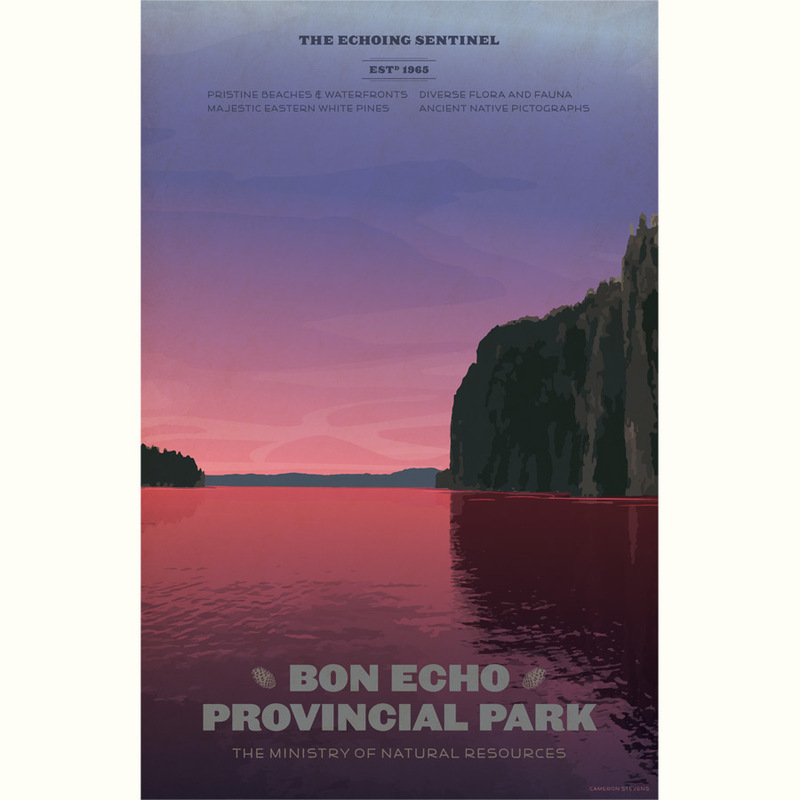 Below, Bon Echo Provincial Park, Art Print from the Canada's Parks series by Canadian artist Cameron Stevens. Available online in sizes mini to x-large from society6. Prints are often thought to be mass-produced copies of famous artworks that are of little to no value. But prints can be just as important as any other artwork and certain prints are known to reach seven or eight-figure prices at auctions. 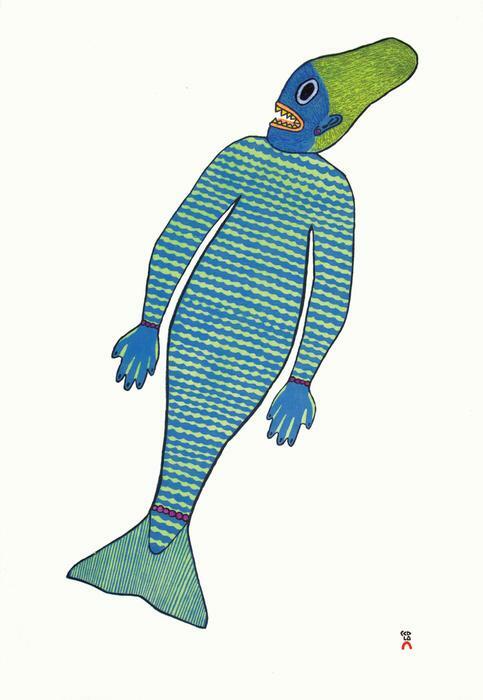 For example, Canadian contemporary and vintage stonecut prints from Cape Dorset are highly prized by a global network of art collectors. The prints vary in price depending on the artist's notoriety and the size of the work. They are always made in a limited edition of no more than 50 and are unveiled every year in the fall at specific galleries across Canada and the best works sell out quickly. The prints usually feature characters from Inuit mythology and Arctic wildlife. What makes them so striking is the intriguing designs and sometimes bold colours set against the starkness of the ivory coloured paper and the level of detail is extraordinary. I really find them to be a delightful art form that brightens up any empty space and you are sure to find the perfect print for your home. Although there are many sizes available, it is rare to find prints for sale any larger than 40 x 40 inches. If you're interested in larger works, original Inuit drawings and paintings are also available. Visit Dorset Fine Arts to learn more about the artists and the printmaking process as well as to view original drawings. Availability of prints and drawings worldwide can be found on the Galleries page at Dorset Fine Arts. Professional Hint: Intense colours in art work well with any decor scheme that is predominantly neutral or white. Below, a stonecut and stencil print from the 2018 Cape Dorset annual print collection titled Spirit in the Limelight by Pauojoungie Saggiak, printed on Kizuki Kozo White paper, priced at $600. Available in-store or online from Craft Ontario. Image courtesy of Craft Ontario. 2. Artist Editions: Another option that is available (between $300 to "sky-is-the-limit" prices), is an artist edition which is an artist's current production of a limited edition artwork. The Vancouver Art Gallery Store is well known for its Artist Editions program with limited editions of prints, screenprints, photographs, and other mediums by distinguished Canadian and international artists. 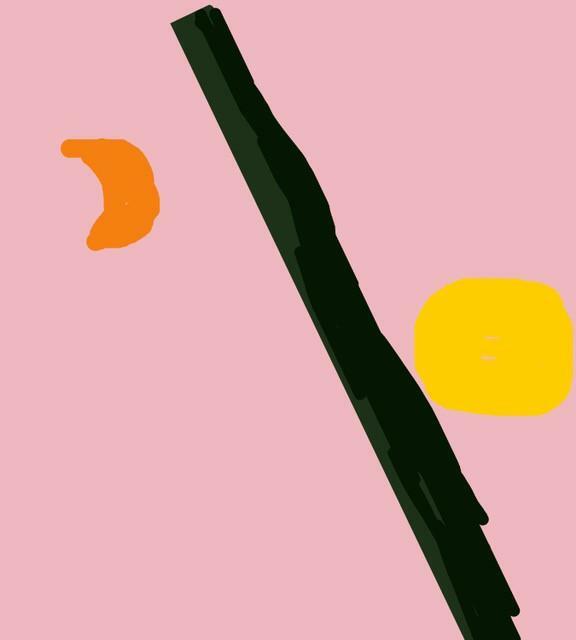 Below, Moon_Line_Sun, 2017, Screenprint, edition of 30, 22 x 20 inches (55.8 x 50.8 cm) by Canadian painter Elizabeth McIntosh, $600. For more information and to place an order, email the Vancouver Art Gallery or telephone 604.662.4705. Image courtesy of Vancouver Art Gallery. 3. Textiles and Fibre Arts: Textiles make for very interesting wall hangings. Textiles, which are now referred to as fibre art, encompass a multitude of materials, techniques and end-products which include anything that is handwoven on a loom or handcrafted from pre-existing natural or synthetic fibres or textiles and non-fibre accessories. There are many different forms of textiles and some of which are crafted using traditional techniques and designs and some which produce a more innovative and modern product. When searching for an attainable form of fibre art for the wall, macramé (which uses cotton, wool, and jute fibres that are knotted into cords or ropes and hung on a wood rod or natural tree branch) is an organic and comfortable wall accessory for any home. Macramé became wildly ubiquitous in the 1970s and is now enjoying a revival. 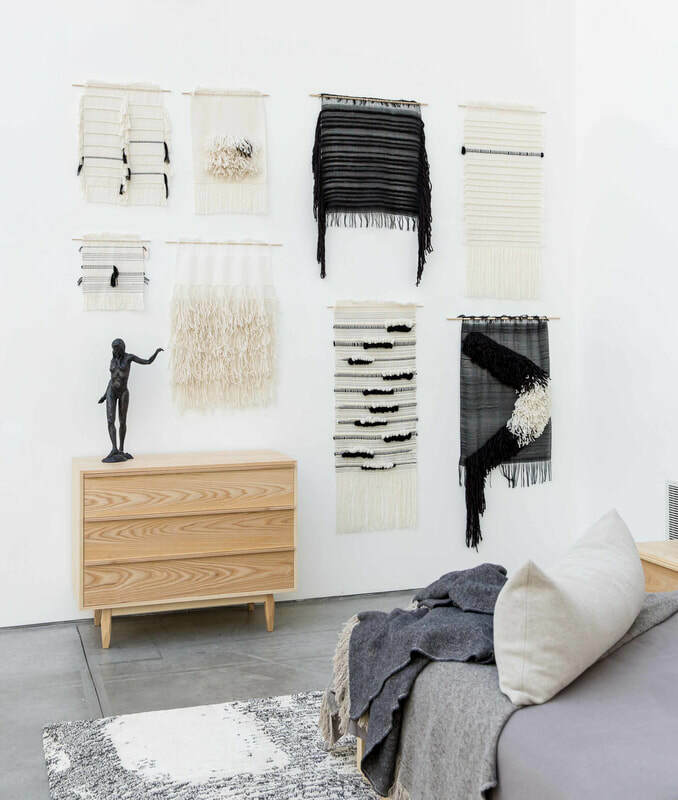 Karèle, the macramé artist behind Boho Montréal, based in Montréal, makes very affordable fibre hangings (from under $100) that range in size from small to large to custom (she can create floor-to-ceiling and room width pieces). Available in a wide variety of designs and colours online. Another talented Canadian artist who makes attainable wall weavings (from under $100) for a more mainstream aesthetic is Ana Isabel Sousa. This Vancouver weaver stocks ready-made pieces available for sale and also takes commissions for larger works where a client can request specific dimensions and custom colours. Professional Hint: I recommend customizing fibre art in order to obtain a larger sized work simply because artists tend to utilize fibres that are muted or neutral in colour and produce ready-made work that is smaller and which do not have enough impact for larger spaces such as hallways or double story staircases. The alternative would be to purchase a few pieces and hang them in a grouping, as shown below, with Sousa's work. Image courtesy of Ana Isabel Textiles. If you are interested in interpretative fibre creations for the wall, Kai Chan is your man. His work seems to be more of a modernist take on the idea of wall sculpture. Chan definitely speaks a unique language and pushes the boundaries of what can technically be classified as textile art. A Toronto based artist, Chan is known for his conceptional genius and he utilizes innovative materials in his quest to create work that replicates emotional states and influenced by his observations of life. His pieces are pricier than your average weaving but if you want something extraordinary, his work fits the bill. Chan describes his work simply: "My work is textile based. They are 3-dimensional and most of them are hung on the wall. They could be site-specific installations to very small-scale objects." 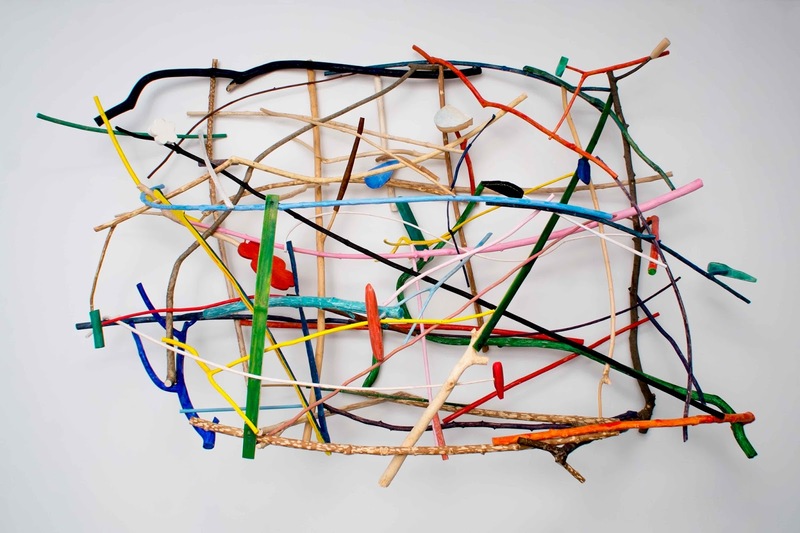 Below, an example of Chan's edgy fibre work titled Happily, 2017, woven from coloured branches. Email the artist directly for availability, dimensions and pricing. Image courtesy of Kai Chan. 4. Metal: You may be wondering How do I hang metal on the wall? Yes, you can hang metal but only if it's art, of course! There is a long history of metal art for sculpture and some of it is made specially for the wall. The Brutalist architectural movement, known for its abstract forms and rough and jagged angles, sparked a trend in interior décor which influenced the art world. C. Jeré (Curtis Jere) was a collaboration between two artists, Curtis Freiler and Jerry Fels, and is one of the most well-known producers of metal art which has inspired a very niche-driven class of artworks, many of which are meant to be hung on the wall. Professional Hint: To prevent damage to the work and to the human inhabitants, hang metal wall art in larger, more open areas and avoid narrow passageways as this type of art tends to be much more 3 dimensional than other wall hangings. 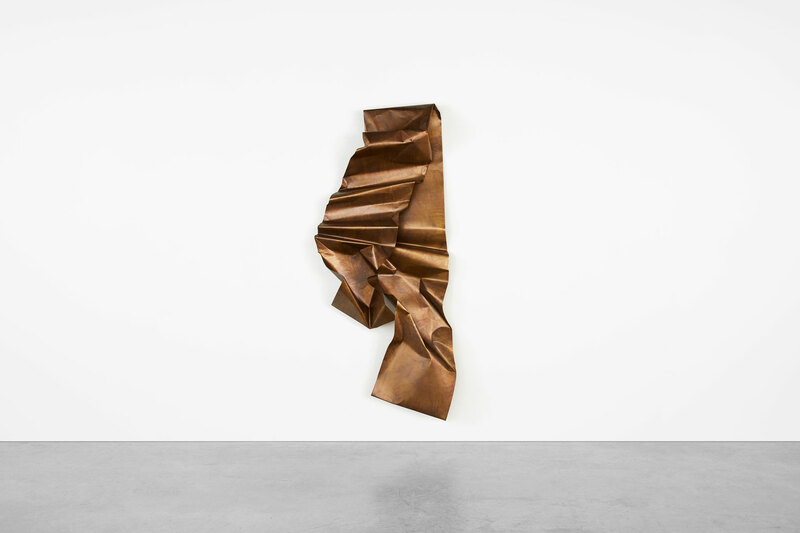 Abby McGuane is an emerging Canadian artist who is reinterpreting metal wall sculptures which are perfect for any space begging for exploratory ideas. 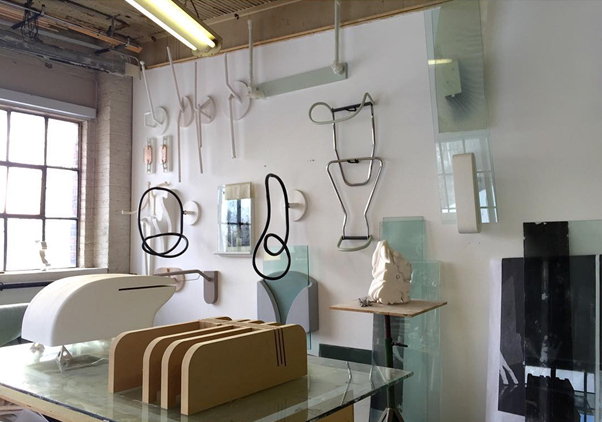 Below, a studio wall full of her abstract and sometimes utilitarian-themed metal wall hangings. Contact the artist for availability and pricing. Image courtesy of Abby McGuane. A big name in metal wall art is Martha Sturdy, a Vancouver based artist and designer. Her one of a kind brass sculptures include many pieces made to be hung on the wall. Prices start at around $12,000 but these are definitely an investment in fine art. I've never seen anything that compares to Sturdy's work. She somehow magically morphs chunky brass into elegant crushed ribbon-like shapes that echo industrial themes but could easily be placed in the most traditional setting and never seem a hair's breadth out of place. Recently, Sturdy has begun exploring weaving brass into textile shapes. So would these be considered fibre or metal art? The jury would never be able to decide! Below, Brass Mountain Top 1811, 2018, brass, 100” H x 37” L x 15” D, $30,000. Image courtesy of Martha Sturdy. 5. Paintings: Globally, the most recognizable form of visual art is a painting that can be classified as anything that uses a somewhat liquefied substance (usually oil, acrylic or watercolour paint) that is applied on canvas or another flat surface and applied using a brush or finger. There is no doubt that paintings can be expensive and some are so expensive, they'll burn a hole in your wallet faster than the fire of a thousand suns. But it is possible to find original paintings that are quite small in scale from $100 to a more decent size at around $300. A rule in the art world is the larger the work, the more costly it will be as larger works are more in demand. As well, the more exposure the artist is receiving, the more sought after the work and the prices start to scale upwards. If you have a good eye, you can catch an artist on the rise and purchase at attainable prices before they rise to the aspirational level. Professional Hint: Try hanging an oil or acrylic painting unframed (watercolours must be framed with a glass front as they are painted on paper). This is totally acceptable and is actually very effective, especially on a large wall. If you're willing to venture into the realm of nouveau art themes, you'll be dazzled and amazed by the work of Keight MacLean. Originally hailing from Kingston, this Toronto based painter is a rare talent. MacLean's paintings are raw and dynamic and she primarily features portraits of women who hark from another era but are painted from a contemporary perspective. Paintings range in size and price and can be purchased directly from Keight Maclean's website. She does ship internationally. Many of MacLean's smaller works are well priced at around $200, medium works are from $500, and larger works are up to $4,500. 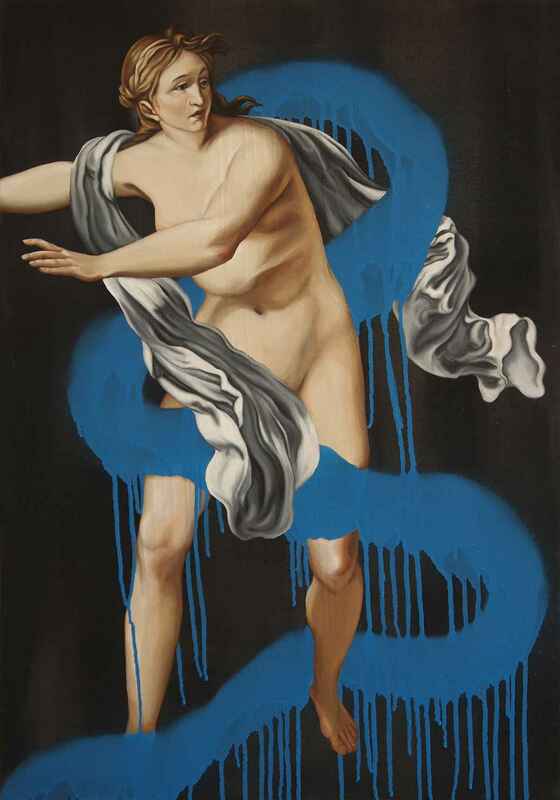 Below, Daphne, acrylic and spray paint on canvas, 28 x 40 inches, $3,500. Available from Studio 22 in Kingston. Peter Triantos is a Canadian painter who is a star in the international art world. For those who have the financial means to purchase important contemporary art from a living master, you may wish to consider purchasing a Triantos work. Although he is most well known for his Jelly Bean series, he has a multitude of other series from which to make a selection. Working with both oil and acrylic on canvas, most of Triantos' works are oversized and his colour choices and subject matter which make a bold statement in any space with large empty walls. 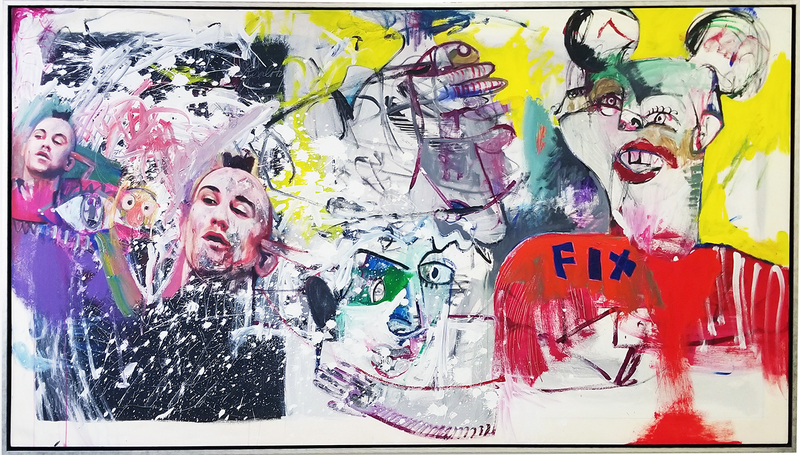 Below, Taxi Driver, acrylic on canvas, 60 x 108 inches (152 x 174 cm). Contact the artist for pricing. Image courtesy of Peter Triantos. 6. Do-It-Yourself: If you want to save money, but insist on owning an original one-of-a-kind piece of art, then YOU should be the artist! Go through some of your digital files and you'll be sure to find a few snaps you took while travelling or spending time outdoors that can be blown up into awesome prints to hang. Our own photographs, (we're not talking selfies here) particularly those featuring a solo person in the middle of an expanse of snow, sand or water, can be so artistic and quite intriguing, especially when blown up to large print sizes. Upload these gems at posterjack.ca, select from a variety of menu options and they'll be printed, matted, framed and delivered to your door just like a pizza (except not quite within 30 minutes but still arriving relatively fast). These types of sites are foolproof and easy to use. You are guided through the entire process including whether the image you've uploaded is going to look good in the size you want to print it. If you'd rather interact with live human beings while getting some personalized guidance, you can always go to a neighbourhood combo print and frame shop. Professional Hint: When hanging more than one work on the same wall, place them in a horizontal row across only if they are all the same finished frame size. If they vary in size, you will need to hang them at different heights. You could also try channelling your inner Burtynsky or Carr by taking an art course. Every city, and even the smallest town has an art or photography school or a public gallery that offers classes in painting, photography and other mediums that can produce wall hangings. This will be a more expensive endeavour than just printing vacation photos. However, brushing up on existing talents or exploring new ones will give you something to look forward to once a week besides Netflix. And just imagine glowing with pride when you bring home a masterpiece (or two or three) to hang in your entrance hallway or living room. Check out adult art courses and workshops at Toronto's Art Gallery of Ontario, OCAD's Continuing Studies, and Montreal Museum of Fine Arts. Below, a stunning perspective photo of the R.C. Harris Water Treatment Plant by David Paul who enrolled as an amateur student at Toronto's GTA Photography Classes and discovered a natural talent for the camera. 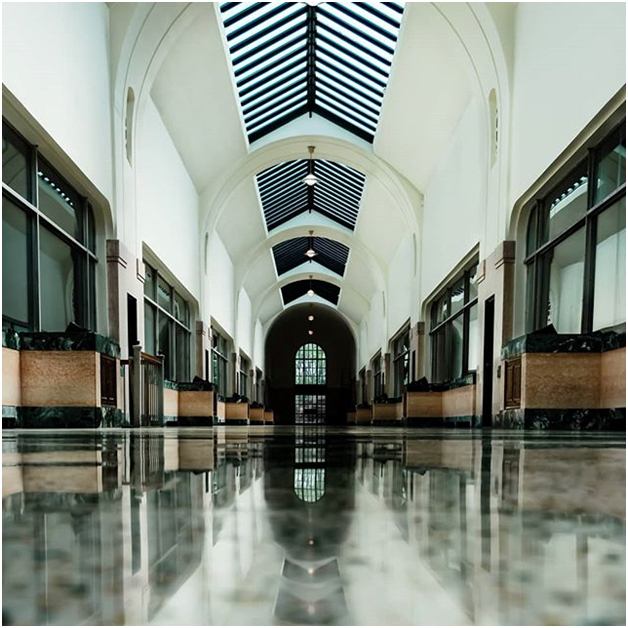 Paul has since gained recognition for his incredible shots of Toronto's urban street scenes and landmarks. Image courtesy of David Paul. Showcasing art in your home reflects a very personal journey. Visual stimuli through colour and form are essential in our most most personal surroundings as they generate vital memories or feelings of belonging, comfort and even healing. When we view art either in our private or public spaces, we connect directly with the powerful force of raw human expression which is often overlooked in the hustle and bustle of daily living. Regardless of how much you spend (time or money), the value that art can bring into your life is priceless. Researched and written by Namrita Kohli, an artist, interior decorator and cultural curator in Toronto.